FBI agent: Shirtless photo was meant as "joke"
The FBI agent who touched off the investigation that led to David Petraeus stepping down as head of the CIA is quoted as saying a shirtless photo of him that he sent to a Tampa, Fla. socialite linked to the scandal was a "tongue-in-cheek joke" he sent to many friends and acquaintances, and wasn't meant to be sexual. Frederick Humphries tells the Seattle Times the photo was sent to Jill Kelley in September 2010. Humphries, 47, was the agent who initially saw the emails the FBI said Petraeus' biographer and mistress, Paula Broadwell, sent to Jill Kelley, a woman she apparently saw as a rival for Petraeus' affections. She also allegedly sent emails to Gen. John Allen, Kelley's friend and the top U.S. commander in Afghanistan. As a friend of Jill Kelley, Humphries took her concerns about the emails she saw as harassing to the FBI's cyber squad in Tampa in June, CBS News correspondent Bob Orr reports. Humphries, a former Army captain who worked in military intelligence, thought the emails raised serious concerns because the anonymous author knew the comings and goings of Allen and Petraeus, a former general who had preceded Allen in Afghanistan. His report back to the FBI started the investigation that led to Broadwell and uncovered her affair with Petraeus. The FBI is reviewing Humphries' later conduct in this case, a federal law enforcement official said Wednesday. Specifically, the bureau is reviewing a telephone call he made in late October to Rep. Dave Reichert, R-Wash., to voice concern that the bureau was not aggressively pursuing a possible national security breach. Reichert arranged to convey the information to House Majority Leader Eric Cantor of Virginia, who checked with the FBI at that time. Cantor was assured the bureau was on top of any possible vulnerability. Lawrence Berger, the general counsel for the Federal Law Enforcement Officers Association, said in an interview Wednesday that his client, Humphries, did nothing wrong and should not be disciplined. "He's committed no misconduct," Berger said and predicted he would be cleared of any misconduct. The shirtless photograph of Humphries helped land him in hot water. The Times reports Humphries sent the photograph to Kelley and others, including one of the paper's reporters, in an email. The subject line read, "Which one is Fred?" 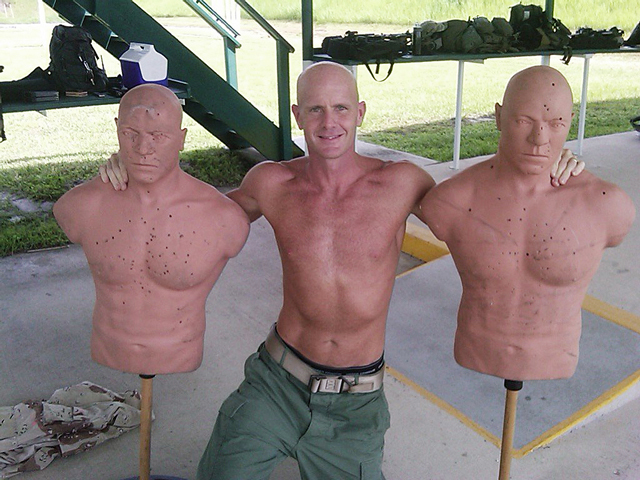 The newspaper says the photo showed "Humphries -- bald, muscular and shirtless -- standing between a pair of equally buff and bullet-ridden target dummies on a shooting range." "Indeed," the Times continues, "among his friends and associates, Humphries was known to send dumb-joke emails in which the punch line was provided by opening an attached photo." Humphries, a veteran counter-terrorism agent, has now been reassigned and his status is being reviewed by the FBI. Orr quotes law enforcement sources as describing Humphries as a solid agent with a good history. Humphries played a key role in investigating a terrorist attack aimed at blowing up Los Angeles International Airport just as the year 2000 dawned and also fatally shot a knife-wielding man in 2010. Humphries joined the FBI in 1996 and first came to prominence in 1999 during the investigation of an Algerian man who was arrested by U.S. Customs agents as he tried to enter Washington state from Canada by ferry. Ahmed Ressam had white powder, chemicals and homemade timing devices in the trunk of his car. Ressam claimed to be a French-speaker from Quebec, and according to a 2002 Seattle Times story, Humphries, then the only French-speaker assigned to the FBI's Seattle office, was asked to question him. It was later learned Ressam was part of an al Qaeda plot to blow up the Los Angeles airport on New Year's Eve 1999. By 2010, Humphries had been assigned to the FBI's Tampa office and was its liaison to MacDill, home to the military's Central Command. On May 19, 2010, 61-year-old Army veteran Ronald J. Bullock, who was camping at the base, got into an altercation with base security. Officials said Bullock sped off on a motorcycle, but was stopped by other security officers and Humphries as he tried to exit a gate. They said he got off the motorcycle and came at Humphries and the officers while brandishing a knife. Humphries fired, killing Bullock. The shooting was later ruled justified.